“As captivating to watch as she is to listen to, Little Sparrow's beautifully emotive use of expression mirrors the sincerity of her delivery, making her someone not to be missed. Her delicately crafted folk songs are created with a combination of flawless vocals, strings, guitars, percussion and tender harmonies. Singer-songwriter Katie Ware adopted the name Little Sparrow as she felt it characteristic of the sound she had developed and the direction in which she wished to travel. Drawing upon influences as diverse as Kate Bush, All About Eve and PJ Harvey she creates songs that are filled with a blend of styles, woven into the colourful tapestry of her music, often with a mysterious fairy tale quality. Little Sparrow has worked tirelessly throughout 2015: her music has been championed far and wide- taking her on the road and playing to new crowds. 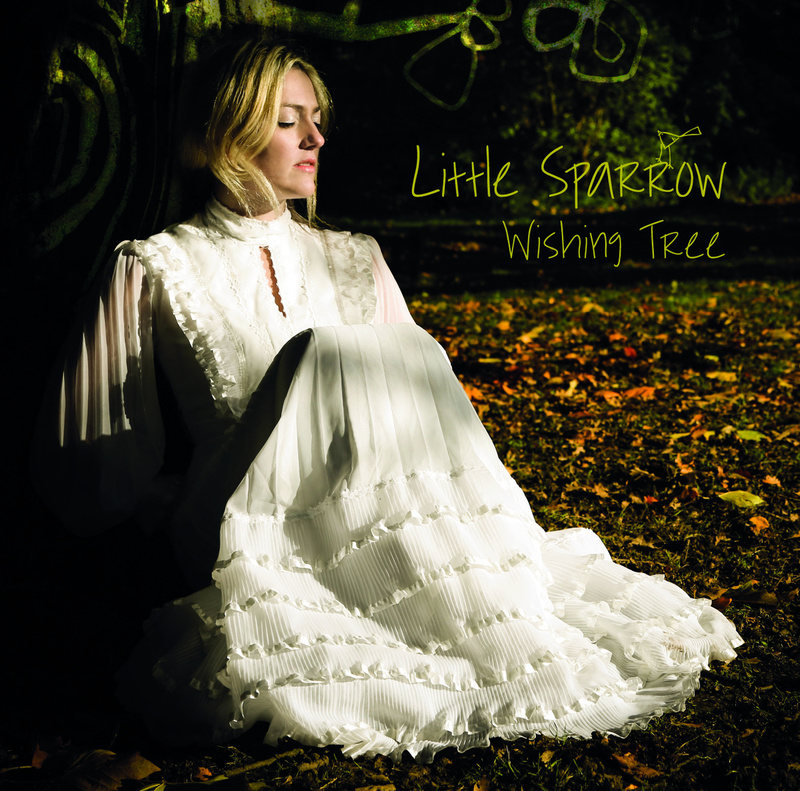 With the music video arriving on Monday- for her Wishing Tree- it is only a matter of time before Little Sparrow is a household name. It is hard to overlook that incredible voice: something that is heavenly and human; emotional and strong- few other singers have that range and sense of captivation. Writing songs that speak to the heart- and paint wonderful tales and vivid scenes- Ware is among the best songwriters in the U.K. - someone who is inspiring others to take up music. When reviewing Wishing Tree, every note and line lodged in the mind: the compositions were (and are) both nuanced and impassioned; the songs filled with detail and prowess- ruled by that insatiable and crystal-clear voice. Take the time to investigate Little Sparrow in the full- through SoundCloud and YouTube- and check out the new music video (arriving Monday). In a music scene with so many unimpressive and sound-alike artists, we need to herald and support her music- that which can truly inspire and impress. The opening notes of Wishing Tree have Country tones: straining and breezy U.S. embers; a romantic and swaying sound that gently beckons the track in. Mixing with Folk strings and the listener is intrigued and fascinated. When our heroine comes to the mic., her initial words are curious and compelling. “Take a step back from the things you see/You might get confused quite easily” make you wonder with whom she is speaking- whether a new love or a former friend. When delivering these lines, Ware ensures the words are carefully and considerably deployed: unveiled with clarity and concision, there is an intentional sense of italicising and precision. As the lines are being delivered in the foreground, there is a light and tripping backing vocal (a repetition of the main line); it is layered and presented so the two threads overlap and intertwine- creating a sensuous mixture of romantic and dominant. Our heroine looks to be addressing a love/man: someone who is on her mind and thoughts; an anonymous beau arresting her thoughts. Wanting (him to be her) wishing tree, Little Sparrow’s voice floats and pervades; flies across the sky- that sense of desire and lust is evident. When assessing the initial stages of the song, I am reminded of two artists: Fleetwood Mac and Tori Amos. Whilst there is an essence of Kate Bush’s mystique and etherealness, there is a suggestion of Fleetwood Mac- especially their Rumours/Tusk period. Pastoral and dreamy; the song could easily fit within those albums. Ware’s voice has suggestions of both Stevie Nicks and Tori Amos: that comingle of huskiness and child-like beauty; womanly strength and vulnerability. As the song continues my initial thoughts are questioned: with regards the exact inspiration of Wishing Tree. As our heroine counts to 10; taking off for the stars, I was starting to rethink my impressions- perhaps there is another subject in mind. With her wishing tree, our heroine floats across the heavens; passing rainbows- the colours seep into her skin- and on its way. Throughout, there is a real sense of dream-fulfillment and longing. Ware’s voice multiples and variates- the backing vocals are hugely effective; the foreground varies its pace and timing- creating something both dizzying and unpredictable. Caught up in the whirl of her own imagination, Little Sparrow is caught in a daze- taking the listener with her. Wanting the stars to (tie her to the ground) you really get seduced by the lyrics and imagery- start to picture yourself with her; follow her in her quest. It is not just the voice that entrances; the composition is changeable and nimble: switching between Country-tinged romanticism to dream-like Folk, there is plenty of depth, colour and variation. The final moments are a myriad of cooing vocal and plaintive strings: the song starts to move to the heavens and complete its work. Ware’s voice remains firm and urgent throughout; never succumbing to tire and ineffectualness- remaining beautiful to the very last note. Having reviewed Wishing Tree last year, it is great to hear it again- and come at it with a fresh mind. Nuanced and spine-tingling, it is a perfect Little Sparrow track: one that demonstrates what a tremendous writer and singer she is. Plaudits must be paid to the production, first of all- that makes the song such a clear and concise wonder. Each note and syllable has clarity and strength; nothing is buried or muted at all- the entire song has a very professional and polished sound. That is not to say it is too polished; the production also provides quite a live-sounding feel to proceedings- earthy and open; expansive and fresh. Ware highlights what an original and strong songwriter she is. Making sure her words contain depth, ambiguity and directness, the listener is open to interpret the song- you can apply different meanings to certain words/lines. At its heart, Wishing Tree is about dreaming and desire; escape and wonderment- that is achieved with aplomb. When it comes to vocals, Ware makes sure she seduces at every moment: from the first line to the last notes, there is no escaping that sense of beguilement and entrance. Aching and sensuous on the one hand; noble and strong the next; few can deny the potency and passion on display- what a wonderful instrument (her voice is). Wishing Tree staggered me last year; it continues to blow me away now- a song that begs for repeated investigation. The future will certainly be a golden one (for Little Sparrow). After speaking with Little Sparrow’s friend (Shay Rowan; who looks after Katie/Little Sparrow) I know how hard things can be: the touring demands and input needed (for her music to thrive) is both challenging and exhausting. Katie Ware is not a woman who tires easily and has been working passionately- ensuring new eyes and ears fall in love with her music. Wishing Tree is an album that is (still gaining) plaudit and commendation- new stations and reviewers are starting to realise how special it is. Fresh from music video recording duties, Ware has been performing some intimate gigs- the young artist never seems to stop working. I am not sure what is in store for the rest of this year (and next year- although there are plans for a new E.P. next year) yet new music is sure to arrive. Following Wishing Tree will be a challenge, yet there is plenty of inspiration and potential- it will be fantastic to see what arrives next. Few solo artists have that same blend of mesmeric vocals and captivating songs; exceptional personality and rare beauty- someone very much made for the stage. Ware is a singer/songwriter that is at home here (on the stage); dedicated to bring her music to the masses- an artist that is hungry and passionate. Wishing Tree is one of those songs that demands repeated plays- it gets inside of your head and will not shake. Struck by the tenderness and beauty of the song, your thoughts go into the wilderness: try and jump inside the lyrics and conspire; dream and float away. The video for Wishing Tree is as captivating as the song itself: shot in the woodland, it sees our heroin (and other figures) dressed in an animal mask- well, a material animal head- given it a quirky and surreal aspect. Whilst Wishing Tree’s dreamy and earnest lyrics unfold, you are presented with these strange and beautiful visions- giving the song an extra layer of beauty and appeal. The video’s innovative use of stop-motion technology gives things a trippy and delirious feel: imagine Radiohead’s video for There There and you get a sense of what to expect. The animal (mask) motif gives the video an eye-catching and dream-like feel- emphasising the song’s sense of delirium and imagination. If you are new to Katie Ware and her exceptional music, make sure you do not miss out- an artist that deserves huge respect and support. Before I conclude- and let you go on your way- I was keen to catch up with Little Sparrow; see what influences her- and what the future holds. Your album Wishing Tree was applauded- by me included- for its stunning vocals and spine-tingling tracks. Which artists- either growing up or now-have influenced your work? All About Eve, Tori Amos, P.J. Harvey, Kate Bush and probably the most influential was my dad's own music! Now I love listening to the people that I normally find while I'm gigging like Tracey Browne and Raevennan Husbandes, Liam Frost, TGElias, Jessca Hoop. Other artists are First Aid Kit, Agnes Obel, Elbow. You are starting to tour quite a bit; see different parts of the world. Do you enjoy touring/gigs? What have been the best aspects about hitting the road? The best bits are meeting all the different people :) My goal this year was to 'play out of Manchester', to play to new audiences. (I am a home bird and thought I should try and fly the nest a little and see what happens!) I am slowly achieving this throughout the year. I love performing, so any opportunity that arises that seems a little exciting then I'm there! I have a few lined up later in the year that are in different parts of the country. A lot of songwriters have different ‘muses’ (when writing music). What subjects/themes go into making a Little Sparrow song? Anything really! Whatever is in my head at the time... A little song I am working on at the moment is about a spider, just because I saw one walking along the floor at the time! But I also write from the heart, so the emotion will always spill out in some way. What does the rest of the year hold for you? Can we expect a new album/E.P. (this year or next)? I am actually planning to hide away for a couple of months in the autumn so I can work on a new E.P., to release maybe later in the year or in early 2016. Finally- and for being a good sport and lovely person- you can pick any song; which I will post here. KEEP your eyes out for this truly wonderful artist.